Fortune tellers, Freaks, People eating Lions and plenty more unfortunate events. At the start of the previous book we saw Violet, Klaus and Sunny climb into the boot of Count Olaf's car and had him drive away, but where did they end up? Well as we find out in this book they end up at the Caligari Carnival. Once again the children use disguises to fool everyone and hide who they are as everyone still thinks they are murderers and of course Count Olaf is still after them and their fortune. So the Baudelaire's disguise themselves as freaks and start working in the freak house at the carnival, with Sunny as a half wolf half human and Klaus and Violet wearing the same outfit to look like one person with two heads. It is at this carnival that the three orphans learn how Olaf has been able to find them each time Mr Poe put them into a new living situation. By using a fortune teller named Madame Lulu. Once realising this the children decide they have no choice but to break into the fortune telling tent and find out what Madame Lulu know's. In the last book we were left with the question were one of the Baudelaire parent's alive? When Count Olaf announces that Madame Lulu has told him that one parent survived the children cannot believe it and go in search of answers, but in all stories with a series of unfortunate events they are of course caught red handed. 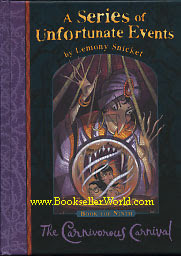 Meanwhile over at the ranch a phrase which if you've read the previous books you will know Snicket himself has used, the freaks are getting ready for the new show, where someone will be thrown to the hungry Lions in front of an audience and devoured by the Lions. Will Madame Lulu help the three Baudelaire's or will she hand them over the Count Olaf? Does anyone get eaten by the Lions? Can Count Olaf win this time? Is there a Baudelaire parent still alive? Read the book to find out... Can't give away spoilers now can i.
I enjoyed this books, i found it so funny that the freaks thought they were freaks just because they were ambidextrous,had a hump and could twist there body in many different way. If this is the case i myself am very much a freak as i am also ambidextrous and have a hump, the hump i'm afraid is a family trait on the women's side. Annoying as it is i wouldn't say it make us freaks. Being ambidextrous actually comes in very handy especially when typing all the time and doing lots of writing as i so often do. I like how the story shows how someone can go from being a nice simple person who you like but given the right set of circumstances can change and well can effectively like in this book end up committing crimes. Given the right or some would say the wrong circumstances people can change right before your very eyes, as i have personally seen myself. Well its onto book ten i go now, but before i do a rating of book nine which of course is a 5* on goodreads. As always any thoughts either comment in the comment section or use the contact form to contact me directly, i'm always happy to hear from people.